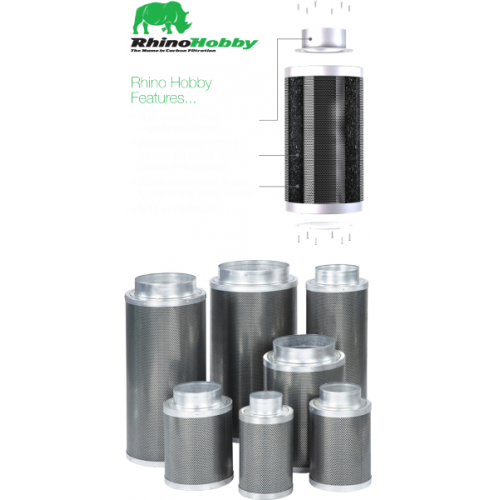 Rhino Hobby Carbon Filters are designed to help those new to gardening use a sophisticated but easy to use filter system. These high quality systems have a long shelf life (8 to 12 months) due to their superior and flexible design. These filters are designed for hobby growers as they are extremely easy to manage due to their smaller carbon bed depth as compared to the Pro filter. Rhino Hobby Carbon Filters are extremely effective at both attacking and absolving air pollutants with 30mm carbon backed into their airflow cylinder. They are designed with Australian-mined RC412 Carbon, which is the purest activated carbon available on the market today. Directions for use: It is essential that the Rhino Hobby carbon filter is matched to the fan in diameter and air flow rate. This is imperative as improve air flow can prevent proper use. Fit according to directions and on the packaging and do not screw on to tightly. The Rhino Hobby carbon filter must be mounted as close to your indoor or outdoor grow space as possible. It needs to be connected to your fan by a fast clamp or duct clip to directly connect the filter to the fan in order to work properly. Never cover the outside of the fan or obstruct it as this will lessen its effectiveness. Rhino Hobby Carbon Filters must be fitted on the intake side of your fan, rather than the outlet side so air can be sucked through them as opposed to being blown out. It is also important to remember that excess moisture can decrease the effectiveness of these filters. Make sure to control the humidity levels of your growth environment.